Do you ever just scroll through suggested book lists on Amazon? (this post contains affiliate links, by the by.) Ever go down that rabbit hole? No? Just me? I don't believe I'm the only book zealot who will lose minutes and hours searching around for books. I REFUSE TO BELIEVE THAT. Well anyway, I found some really enchanting looking books that are coming soon, either in late summer or early fall. I can't wait to see ALL of these in person! 1) 'Journey' by Aaron Becker. Just look at it! Look at that castle! Using a marker, a girl creates a magical portal into another realm, wherein she is apparently soon captured by a sinister emperor. If the cover of this book is any indication of what's inside...well sign me up. For ages 4-8. 2) 'Flora & Ulysses - The Illuminated Adventures' by Kate DiCamillo (author of 'The Tale of Despereaux') has written a new tale about a squirrel named Ulysses. A squirrel sucked into a vacuum. A squirrel saved by a young girl. A squirrel who becomes a superhero! This is a novel with comic-book style art and full page illustrations for ages 8+. 3) 'The Big Wet Balloon' by world renowned cartoonist Liniers. This picturebook for beginning readers looks just amazing! Two sisters, Clemmie and Matilda, navigate their way through a rainy day, and of course, learn a little something about being sisters in the process. For ages 4-8. 4) 'Patrick Eats His Peas' by Geoffrey Hayes. I'm most excited about this one! I wrote a post about the first Patrick book a couple of years ago. It is the sweetest book and Julia carried it around with her for two weeks straight. It was the first book she attempted to read on her own. Patrick is the cutest bear you will ever, ever see. And he has the most darling and adorable and wee adventures, which are Very Big in his mind. I LOVE PATRICK! 5) 'The Boy Who Swam With Piranhas' by David Almond and illustrated by the genius Oliver Jeffers. This is a story about a boy with a mean uncle who has a fish canning obsession, causing the boy to run away. Strange adventures at a carnival ensue, which include swimming with piranhas. It sounds bizarre, but I have the utmost faith in anything to which Oliver Jeffers attaches his name. For ages 9+. 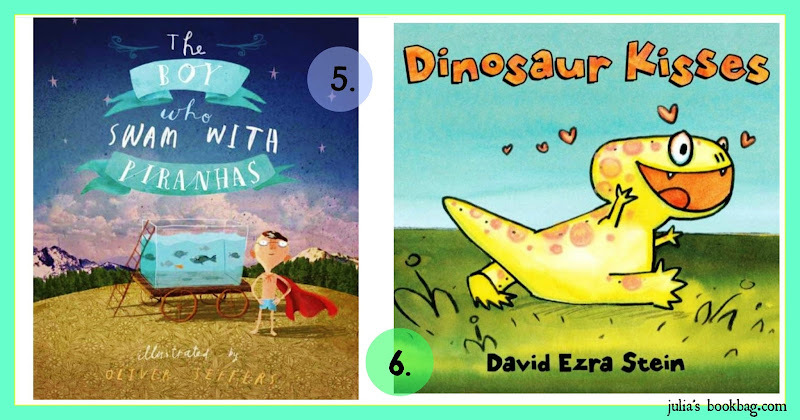 6) 'Dinosaur Kisses' by David Ezra Stein (of 'Interrupting Chicken' fame) has a new one coming about a little dino who has to learn who to give gentle kisses without chomping and biting. Dino crazed toddlers everywhere will probably love this! When Julia was two, she referred to herself as "Julia T-Rex." See anything you like? Having things to look forward to is a Fine and Wonderful Thing! It keeps one going, the promise of fabulous books. I'm already excited for fall. I'm always a season or so ahead in my mind. Always. Which is weird and strange, but I think blogging makes one be on the lookout for what's ahead. Beautiful book list!!! I would love to read the Journey and that Dinosaurs book would make a bit hit here because all the boys are crazy about dinosaurs! I'm most likely re-entering the working outside of the home workforce this fall, and I'm spending most of time planning for my blog, like, oh I'll have to do cooking projects and book photos on the weekend, so I can get natural light! Isn't that Dino book so adorable? Congrats on such exciting news!!! Good luck with planning ahead! It's a challenge but so much fun! 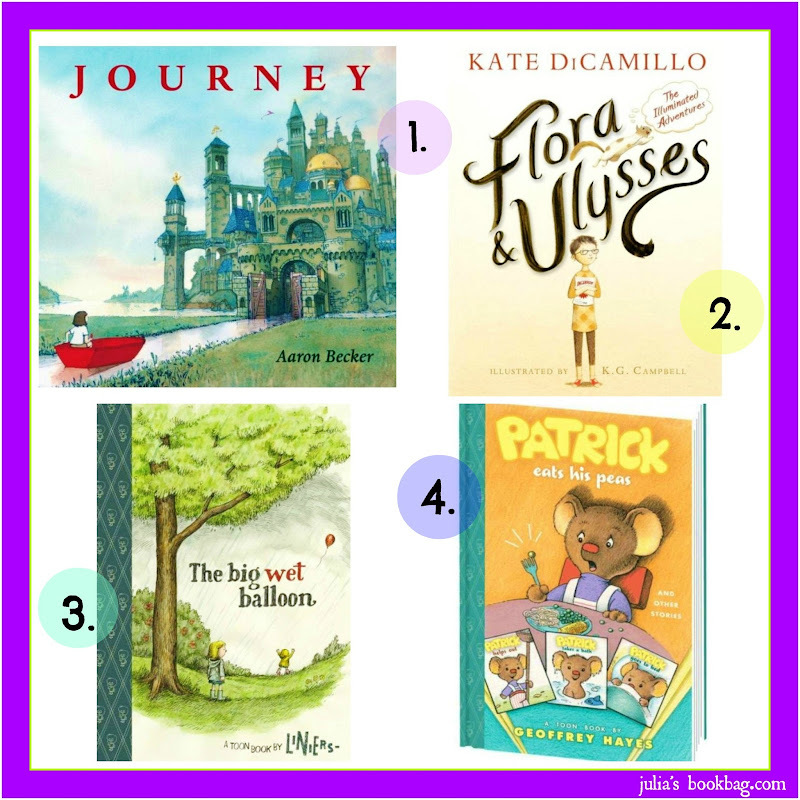 I've been ecstatic ever since hearing about Kate DiCamillo's new book. And I'm also looking forward to Journey. I didn't know Oliver Jeffers had a new book coming out, and the other ones all look good as well. I need to get the Patrick book...haven't even heard of that one! Oh Amy, the Patrick book....it is the cutest thing EVER! I can't wait for this next one, I am so so excited! The Kate DiCamillo and Almond/Jeffers collaboration = very excited me! But really, everything you highlighted looks worth checking out! Plus, pinranhas. I can tell that the DiCamillo book is going to be showing up in every book bloggers household this fall or holiday season! It sounds neato mosquito. Browsing the upcoming releases is one of my very favorite pastimes! It's just the best to have such wonderful things to look forward to!!! I've been reading Despereaux to the boys every night before bed... it is one of the best books I've read aloud to them yet! (short tiny chapters are my favorite... that means each night we get in 2-3 chapters which really excites the boys!) so yes, can't wait for Kate's new book! And of course anything Jeffers... anything. Everything looks just wonderful! I am obsessed with the upcoming books. I usually stalk them via Kirkus Reviews. Thanks for including (and finding!) Journey on your list. Who knew Amazon was listing it so prominently?!! Keep your eyes out for the book trailer which should be out next week. You can see some of the interior spreads at storybreathing.com if you so desire... And enjoy this summer solstice! Happy summer solstice right back! Mmm...these look yummy! I want them all. I too, get lost on amazon--it is a very dangerous habit!! Can I just say, I love your blog! I just pop on over and make awesome discoveries on everything I love (food, books, food, crafts, hot actors and food)! Thank you, friend!